The Industrial Supply Association named Engman-Taylor of Menomonee Falls, Wisconsin, and Walter USA of Waukesha, Wisconsin, winners of the American Eagle Excellence in Industry Award at its 2017 Convention in Denver. The two companies joined together to generate more than $1.4 million in savings for Mennie Machine, a Tier One automotive supplier in Mark, Illinois. The company was struggling with long cycle time, excessive deburring and inconsistent tool life in the production of a fuel pump housing head for a major engine manufacturer. Distributor Engman-Taylor, which manages tooling inventory for Mennie, recommended utilizing its Cost Circles program and Walter’s Multiply program to analyze and review the entire process from tool procurement and implementation, to reconditioning. After extensive analysis, the effort reduced Mennie’s cycle time by 32 percent, lowered tooling costs by 15 percent, eliminated three CNC machines out of 11 from the production process and also drastically cut scrap rate and tool breakage. “Team is a very important part of Engman-Taylor. Everything we do revolves around team. This award underscores and enforces that concept. The success during this process would not have been possible without us working as a team with Walter, and our customer partner Mennie Machine,” said Jim Mueller, vice president of operations for Engman-Taylor, in accepting the award. “Using our new digital tools, our ability to be able to precisely and accurately predict what we can do in processes is phenomenal. Working with cutting edge tools, software and knowledge bases is the reason why we were able to accomplish so much,” said Muff Tanriverdi, president of Walter USA. 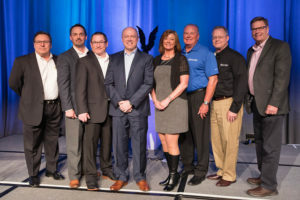 The Excellence In Industry Award recognizes companies in the maintenance, repair, operations and production (MROP) channel for their commitment to driving value to channel partners. Qualified candidates demonstrate excellence in one or more areas, including: communicating with channel partners, introducing innovative products and services that create new business opportunities. Past winners include Stellar Industrial Supply, Tacoma, Wash., and Sandvik Coromant, Fair Lawn, N.J. (2016); and SGS Tool Supply Co. of Munroe Falls, Ohio (2015).